Hundreds of years ago Galileo pointed a very simple telescope toward the planet Jupiter. He was amazed that the little dots of light near Jupiter seemed to move back and forth in an organized way. Later mathematicians like Kepler and physicists like Newton used observations of planets and moons to describe laws and develop theories of gravity and motion. With our own telescope observations we will collect and analyze data so we can retrace Galileo's steps and the thinking of Kepler and Newton. The steps you use in this activity to understand the orbits of Jupiter's moons can be used for any planet. Students worldwide have been watching and collecting data about Jupiter. You will be able to work with this data to map out the orbital periods and speeds of Jupiter's moons. You also might collect your own data or request images to carry out your own research. The process simply is to look at and collect data from images of Jupiter and its moons. You record the time and position of the moons as they move about Jupiter. If a moon reaches what appears to be an extreme position relative to Jupiter, that is called elongation, then you can determine the radius of the moon's orbit. Next, you record the position and the time for any moon of Jupiter, and given it's orbital radius, you can use geometry to figure out approximately what it's orbital period might be. If you know the size of Jupiter in miles or kilometers, you can figure out the speed of the moons as they orbit Jupiter. out about a system that you can see but not physically touch or go there is a challenge in astronomy and other sciences too. In this project, you will lean to interpret data in images to figure things out about Jupiter and its moons. Students will be able to determine orbits of Jupiter's moons, both the period of the orbit and the speed of the moons in orbit. 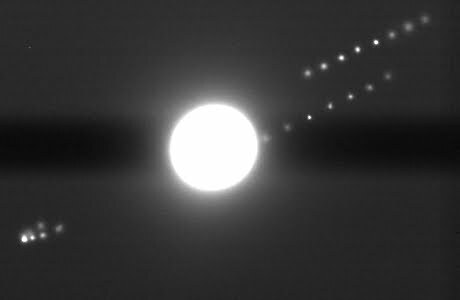 If they complete such activities with all four moons, they could see an example of how Kepler's Laws work and/or derive these laws for themselves. One nice result of completing these projects is that students learn to change their perspective when analyzing images. The perspective changes from looking at Jupiter and its moons from an 'edge on' perspective from our vantage point on Earth, to imagining a perspective from above in creating their interpretation and model of what the data represents. Subpages (7): Analyze the Information Combine All the Images Drawing the System From a Different Perspective Gather Images of Jupiter Identifying the Moons Look at Jupiter Through a Telescope What could we do next?